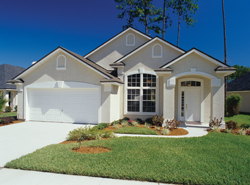 Narrow lot house plans are designed with a width footprint 40’-0” or less. Although these house designs may be smaller in width, they often pack huge style and offer creative ways to enhance storage and living spaces. With land prices continuing to climb, homeowners are turning to smaller lot sizes to build their dream home. And, often to increase their square footage, house designs for a narrow lot are built up instead of out. These narrow floor plans may be small, but they're mighty with great style. 2659 Sq. Ft., Width 52'-0", Depth 48'-6"
The Simeon Tudor Home has 3 bedrooms, 2 full baths and 1 half bath. 1062 Sq. Ft., Width 30'-0", Depth 62'-0"
The Saffold Modern Home has 3 bedrooms, 1 full bath and 1 half bath. 1015 Sq. Ft., Width 19'-0", Depth 24'-0"
The Tova Modern Home has 2 bedrooms and 1 full bath. 631 Sq. Ft., Width 18'-0", Depth 44'-0"
The Tranquil Haven Craftsman Cabin has 2 bedrooms and 1 full bath. 700 Sq. Ft., Width 20'-0", Depth 38'-0"
The Fenton Craftsman Home has 2 bedrooms and 1 full bath. 643 Sq. Ft., Width 20'-4", Depth 32'-0"
The Malina Modern Prairie Home has 3 bedrooms, 2 full baths and 1 half bath. 1679 Sq. Ft., Width 25'-0", Depth 45'-0"
The Heath Hill Ranch Home has 3 bedrooms and 2 full baths. 1603 Sq. Ft., Width 50'-0", Depth 45'-0"
Discover stylish narrow lot house plans at House Plans and More. Narrow lot dwellings are here to stay thanks to the rising cost of land. But, these narrow, yet functional designs offer so much great living space they are often very suitable for deep lots. Shop our narrow lot house designs and fall in love with a great plan perfect for your lot.